NEW YORK (CNS) — First published in 1937, Catholic author J.R.R. Tolkien’s children’s novel “The Hobbit, or There and Back Again” has proved so popular in the decades since that it has never gone out of print. With “The Hobbit: An Unexpected Journey” (Warner Bros.), director Peter Jackson provides movie audiences with an epic 3-D screen version of the opening part of Tolkien’s widely beloved work. Not for the easily frightened nor — at well over two-and-a-half hours — for those with short attention spans, his sweeping journey across Tolkien’s imaginary world of Middle-earth is nonetheless an upbeat outing suitable for all others. In this first installment of a trio of prequels to Jackson’s “The Lord of the Rings” trilogy (2001-03) — also, of course, based on Tolkien’s fiction — homebody hobbit Bilbo Baggins (Martin Freeman) finds his contented existence within the safe confines of Middle-earth’s Shire region disturbed by the arrival on his doorstep of magisterial wizard Gandalf (Ian McKellen). Gandalf has seemingly unlikely plans for timid Bilbo: He wants him to accompany and aid a group of dwarves on a dangerous quest. Led by their sturdy chieftain Thorin Oakenshield (Richard Armitage), the dwarves — a crude but spirited lot who descend on Bilbo’s house at Gandalf’s invitation — are out to recapture their ancient stronghold, Erebor. Once a storehouse for the dwarves’ fabulous wealth, Erebor was long ago conquered by Smaug, a rampaging dragon who coveted its vast horde of gold. Though Bilbo initially wants nothing to do with the dwarves’ perilous mission, in the face of Gandalf’s insistence, and perhaps sensing his own destiny, he eventually relents. The heroism of ordinary people and the potential for everyday goodness to subdue evil are the primary themes of the long, combat-heavy adventure that follows. Tolkien’s tale can be viewed as a sort of prophecy, foretelling the down-to-earth courage with which his British compatriots would soon confront the onslaught of the Nazi war machine. 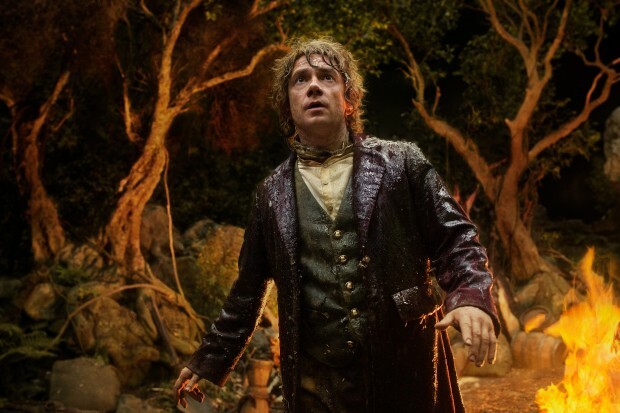 As Bilbo proves his mettle, the corrupting effects of power are also showcased through his encounter with Gollum (Andy Serkis), a cave dweller obsessed with — and spiritually enslaved by — a magical ring. Gollum’s grasping character also may relate to the current events of the 1930s, given that the period between the world wars saw the rise of numerous dictators bent on aggression and acquisition. But the endurance of the story in which he appears suggests that his traits may have a broader moral application as well. The film contains much bloodless action violence and some mild gross-out humor. The Catholic News Service classification is A-II — adults and adolescents. The Motion Picture Association of America rating is PG-13 — parents strongly cautioned. Some material may be inappropriate for children under 13.